Variable. Print the current path to the engine configuration file. Command. Set a new path to the engine configuration file. Command. Remove all the loaded, but unused resources. Variable. Print the value indicating if the case of file names in the data directory is ignored. Command. Ignore the case of file names in the data directory. Operations, representing information on the file loading queue. Command. Print names of the queued files, if any. Variable. Print the current time delay between the loading of the queued files in seconds. Command. Set the time delay between loading of the queued files in seconds. For example, this function can be used to debug streaming of resources. To hide the visualizer, pass "" as an argument. Command. Display contact points between physical bodies. Command. Display joints between physical bodies. Command. Display collision shapes for physical bodies. Command. Print the Microprofile settings: the maximum number of frames that can be profiled, the number of dump frames, the flag indicating if the GPU profiling, the status of the Web server, Web server port, the number of webserver frames. 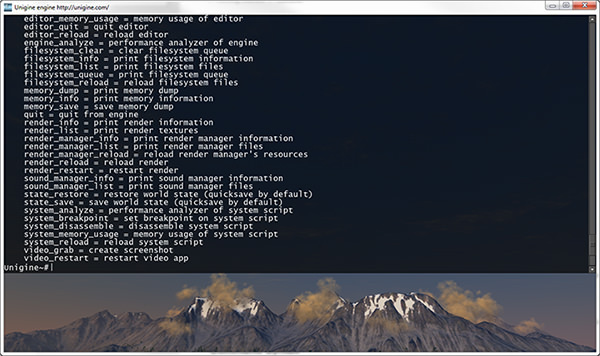 If the application is compiled without Microprofile, the corresponding message will printed to the console. Command. Enable or disable the bloom effect. Command. Set the far focal offset for DoF (Depth Of Field) effect. The offset from the focal to the farthest blurred zone. Command. Set the near focal offset for DoF (Depth Of Field) effect. The offset from the focal to the nearest blurred zone. Variable. Print the exposure value. Command. Set the exposure value. Command. Enable the ray tracing for SSGI (Screen Space Global Illumination) calculation. When enabled, SSGI recreates light reflections from the object’s surface. Ray-traced SSGI calculation available only when the SSRTGI technique is enabled. Command. Enable the noise reduction for the ray-traced SSGI (Screen Space Global Illumination). This option reduces noise by using blur effect. Ray-traced SSGI calculation available only when the SSRTGI technique is enabled. Command. Set the threshold value for the ray-traced SSGI (Screen Space Global Illumination). Ray-traced SSGI calculation available only when the SSRTGI technique is enabled. Variable. Print the value indicating if the alternative TAA is enabled. The alternative TAA provides better anti-aliasing but produces more blurred image. Command. Enable or disable the alternative TAA. The alternative TAA provides better anti-aliasing but produces more blurred image. Variable. Print the value of the multiplier for color of HDR cross flares. Command. Set the multiplier for color of HDR cross flares. Variable. Print the number of the cross shafts. Command. Set the number of the cross shafts. Variable. Sets the length of a cross flare. Command. Print the length of a cross flare. Variable. Sets the cross flare angle. Command. Print the cross flare angle. Variable. Sets the cross flare threshold. Command. Print the cross flare threshold. Variable. Print the value indicating if dynamic reflections blurring is enabled.. Variable. Print the value indicating what mode of the adaptive exposure effect is enabled. Command. Change the mode of the adaptive exposure effect. Variable. Print the value of the lens flares length. Command. Set the value of the lens flares length. Variable. Print the value of the lens flares radius. Command. Set the value of the lens flares radius. Variable. Print the value of the lens flares threshold. Command. Set the value of the lens flares threshold. Variable. Print the value of the lens flares dispersion. Command. Set the value of the lens flares dispersion. Command. Enable alpha test for shadows. Variable. Prints the value indicating the current precision of soft shadows. Command. Sets the value indicating the current precision of soft shadows. Variable. Print the value indicating if sun shadows shafts are enabled. Command. Set the scale of the sun shafts. Variable. Print the value indicating if the shadows cascades lerp is enabled. Command. Enable or disable the shadows cascades lerp.